Genesis Todd's Adventures in Slime World (USA) in 00:42.8 by FractalFusion. Todd's Adventures in Slime World is a platform game developed by Epyx and published by Atari. 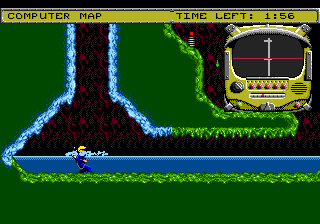 You play as Todd, a boy exploring an alien planet that is made entirely of slime. After finding out that Slime World is melting, he rushes to find his way back through the mazelike corridors to the safety of his ship. This publication, unlike the previous one, features the impressive keyboard solo in the ending theme.